Welcome to the 99Tutors.com page created specifically for our students at Austin Community College! We have been tutoring students at ACC in the subjects of Mathematics, Chemistry, Physics, and more. We help ACC students to achieve high grade marks and handle their course work with confidence. 99Tutors selects from hundreds of tutoring applicants in the Austin, TX area to provide you with only the most talented and knowledgeable tutors. Our tutors are most often those who have taken the same courses you are now seeking assistance for, and have first hand knowledge of the course materials and the instructor's style. At 99Tutors we know that getting started with tutoring can often be the most difficult part of the process. 99Tutors makes matching you with the right tutor quick and simple. When you select 99Tutors we go to work immediately to match you with a professional tutor and schedule a meeting so that you can assess the tutoring relationship. Our goal is to see you excel in your classes. Today's students are smart and very savvy, and the competition has never been higher in many Texas schools. Standing out as a student that is prepared, knowledgeable, and confident can be achieved with the help of 99Tutors who have the experience and training that gives you an edge. We offer a variety of tutoring packages that are designed for everyone including those needing private tutoring and tutoring sessions for groups. If you have questions about group tutoring or would like more information on how to schedule a tutoring session for your apartment community or student group give us a call in Austin, TX at 512-354-7656. There is a $32 to $45 per hour charge that can be discounted when you purchase packages with up to 33.3% off the hourly price. A $35.00 non-refundable administrative fee is required to schedule your first meeting with your tutor. A minimum 5 hours tutoring is needed and 10 hours (or higher) packages can be split between courses. After we get your application and administrative fee we will have one of our 99Tutors get in touch with you and set up a time and place for your first meeting. If you have questions about our private or group tutoring prices contact us directly to learn more about our services and rates by emailing us at info@99tutors.com. Sign up here! 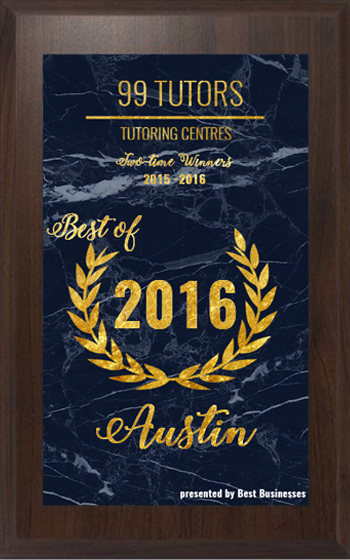 99 Tutors has been selected for the 2016 Best Businesses of Austin Award in the Tutoring Centers category by the Best Businesses of Austin Award Program. This is the second time since 2014 that 99Tutors has been selected for this award.